Bug has been way into working with clay these days. 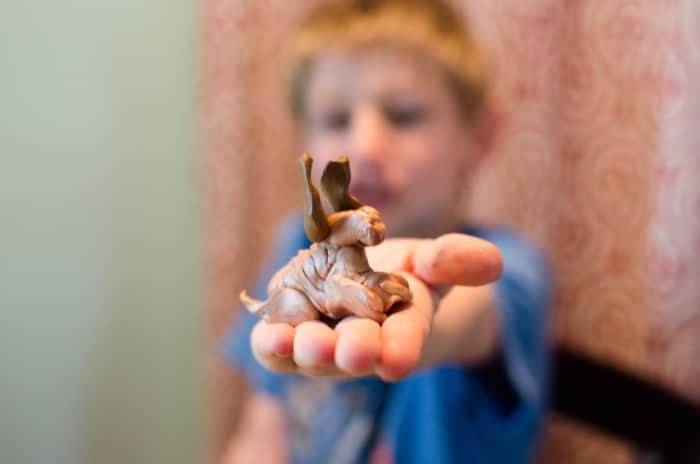 His Nana (my awesome mom) is a polymer clay artist in San Diego (visit her in Artist’s Village in Balboa Park next time you are in the area!) and she brought a whole bunch of clay with her when she came to visit last. Bug has loved exploring with it, but for the last couple months, many of his creations have been in the “Flat Stanley” style, and I really wanted to see him grow in his skills and technique. Enter ARTistic Pursuits. We’ve used the program in the past, so when I saw their Sculpture Technique: Model book, I just knew I needed to get it for Bug. We’ve been using it a little over a month now for this review, and I am so pleased with the progress I have seen with his art. 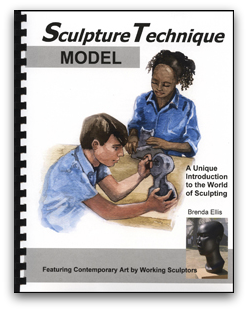 Sculpture Technique: Model is written for kids ages 11-18. 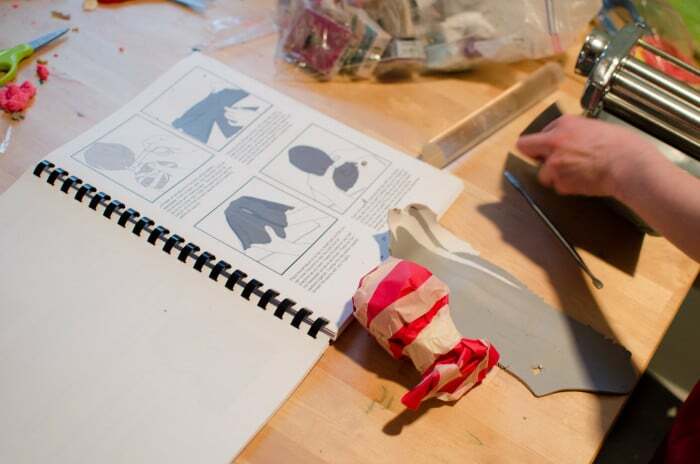 This is not just a craft book. There is so much more than just ideas for projects inside it’s pages! ARTistic pursuits combines art appreciation and history with lessons on technique and the elements of art to form a complete art education. This book is a year-long course. Throughout the book, famous sculptures are shown and discussed. This book is a year-long course, and we jumped around a little bit for this review. Like many homeschoolers, I tend to tweak curriculum to fit our needs, so we started right at unit 2, the unit on clay, because that’s what Bug has been interested in right now. The instructions call for basic oven bake clay which you can find at an art store and then paint when the project is done, but since we have such a huge stash of colored polymer clay, I let Bug use that for his projects instead since they work almost the same way. The biggest downside to using polymer is that these projects are larger scale than we would typically do with polymer clays, so it took quite a bit of packets to have enough for the projects. Unit 2 starts with a discussion on scale and choosing how big or small to make your project. Then, the curriculum goes over the properties of clay and how to work with it. 1. Using the Pinch Method- for this project Bug made pinch pots, and used his fingers to pinch and form the sculpture. 2. 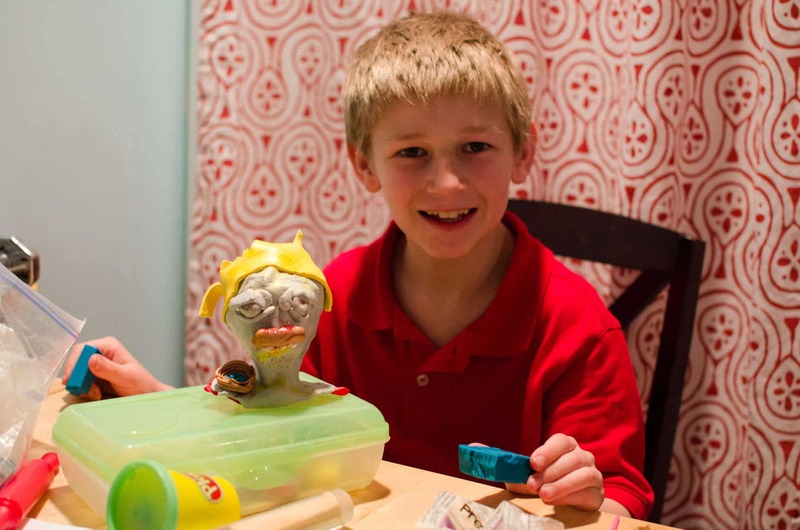 Using the Slab Method- for this project, Bug rolled the clay into flat slabs before creating his sculpture. 3. 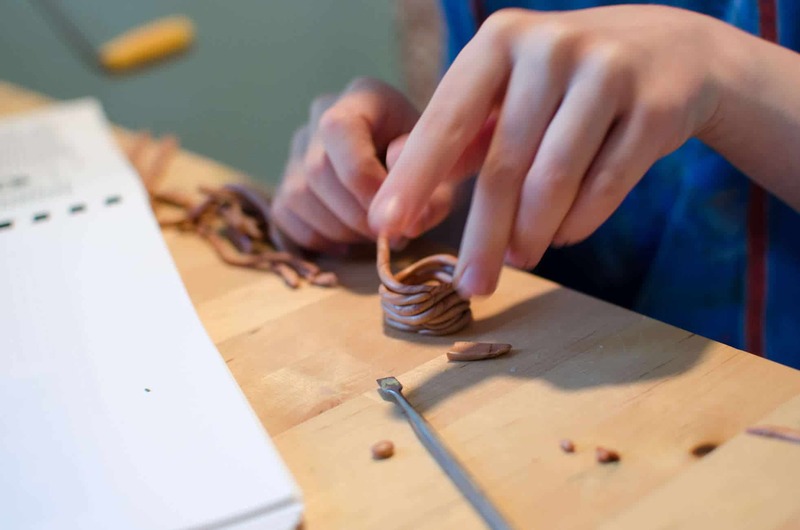 Using a Paper Armature- for this project, Bug created the basic shape of the sculpture first out of paper to stand as a form, and then used a slab of clay to lay over the paper as the base for his sculpture. 4. Using the Coil Method- for this project, Bug made coils out of the clay and wrapped them around to make a hollow form for his sculpture. At the end of the unit, there is an evaluation you can do with your child. This evaluation is not a test but instead is a tool to help you and your child reflect on the work they have done, and the progress they have made. I really love this part of the program, because it gives Bug and I a chance to sit down and chat, and I love hearing his thoughts on the process he went to create his projects. The questions involve things like discussing how the properties of the clay affected the scale of the project he chose to create, and what difficulties he had with the different techniques. I loved listing to Bug talk through the things he struggled with and how he was able to overcome the challenges of learning a new skill. Other than the evaluation sections, this book for this age range can be self-lead. Bug tends to pull it out after dinner while I sit down to do computer work on the other side of the room. Other than the occasional question, the only time he needs me is when he wants to show me his latest creation. We found that this book has a lot of very good “jumping off points” for more creative projects. Bug tends to start with the project in the book and create an almost identical piece of art, and then he gains the confidence to design something else entirely using the same techniques. That, to me, is what makes this program a winner. It does a fantastic job to teaching the skills and techniques needed but doesn’t stifle the creative process. I really appreciated that I could open up a lesson with him, and I knew that he was going to be able to read about the famous piece of art, and the technique before he started his project. I feel like this gave him an understanding of why he was supposed to try to do it in a certain way. Each of the projects have step by step illustrations so he always knew what to do next, even without my help. I really love this series and have enjoyed the books we have tried from them. I really would like to own the entire set to have available to my kids!